PVMBG and BNPB reported that a M 6.4 earthquake was recorded at 0547 on 29 July, shaking the islands of Lombok, Bali, and Sumbawa, and causing significant damage to buildings (including collapses) and roads, ground cracks, multiple injuries, and the death of 17 people in Lombok. The hypocenter was 24 km deep, and 47 km NE of Mataram City. Aftershocks were numerous and as large as M 5.7. The earthquakes caused remobilization of ash deposits on Rinjani as well as landslides. There were 1,226 visitors to the Mount Rinjani National Park Area at the time, and, according to news articles, about 690 climbers were on the volcano and had to be rescued. One person in the national park died from rockfalls. The Alert Level remained at 2 (on a scale of 1-4); the public was warned not to approach the crater within a 1.5-km radius. An eruption at Rinjani that lasted two months, between 25 October and 24 December 2015 (BVGN 41:08) included ash plumes rising to 6 km altitude and lava flows from the Barujari cone that reached the Segara Anak lake within the caldera. A new eruption that began on 1 August 2016 generated ash plumes to about 10 km altitude. After another period of quiet, small-scale explosive activity on 27 September stranded a number of trekkers on the slopes and caused the Alert level to be raised to 2. No further activity was reported in 2016. Based on satellite and pilot observations, the Darwin VAAC reported that an eruption on 1 August 2016 generated an ash plume that rose to an altitude of 9.8 km altitude and drifted S. The ash plumes were first visible in satellite images at 1150, and according to the Pusat Vulkanologi dan Mitigasi Bencana Geologi (PVMBG, also known as the Centre for Volcanology and Geological Hazard Mitigation), passengers aboard a passing aircraft saw ash plumes rising 2 km above the crater (figure 27). The National Agency for Disaster Management (BNPB) noted that the Lombok International Airport closed at 1655 and was scheduled to reopen at 1000 the next day. Later on 1 August ash plumes rose to altitudes of 4.3-6.1 km altitude and drifted S, SW, and W. No plumes were visible at 1730; conditions had returned to normal levels, although BNPB warned that the public should stay at least 1.5 km away from the volcano. Figure 27. 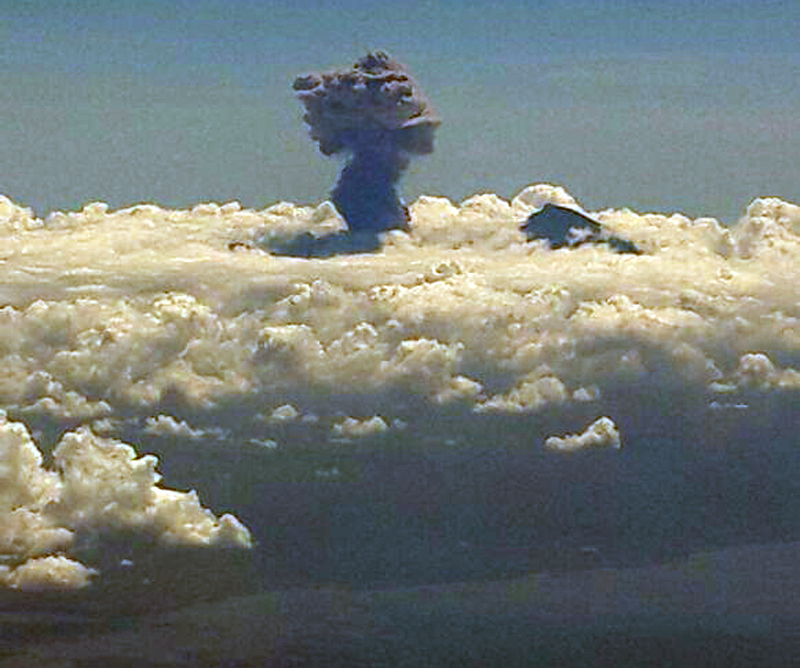 Photo taken by an airline passenger of the explosive eruption at Rinjani on 1 August 2016. The plume was described as rising about 2 km above the crater. Image has been color adjusted to enhance contrast. Courtesy of PVMBG. PVMBG reported that at 1445 on 27 September a small explosive eruption at Barujari Crater produced an ash plume rose that rose 2 km above the crater and drifted WSW. The eruption was preceded by an increase in seismicity, but the number and amplitude of the events were insignificant. The Alert Level was raised to 2, and the public was warned not to approach the crater within a 3-km radius. Based on data from the Mount Rinjani National Park, BNPB reported that as many as 1,023 tourists were on Rinjani when it erupted on 27 September; officially only 464 people were registered to make the 3-day trek to the volcano and back. Officials began the evacuation of tourists that day. The Jakarta Post reported on 1 October that the West Nusa Tenggara Disaster Mitigation Agency (BPBD NTB) had called on representatives of foreign countries to file a report if they had citizens still missing in the climbing area. The agency made the request following reports that 44 tourists had not yet returned from climbing the mountain. BPBD NTB head Muhammad Rum said it was possible that the climbers had returned, but had not yet been recorded, or had not passed through either of the two official entrances. The Jakarta Post reported on 5 December 2016 that hiking routes were once again open. Information Contacts: Pusat Vulkanologi dan Mitigasi Bencana Geologi (PVMBG, also known as Indonesian Centre for Volcanology and Geological Hazard Mitigation, CVGHM), Jalan Diponegoro 57, Bandung 40122, Indonesia (URL: http://www.vsi.esdm.go.id/); Darwin Volcanic Ash Advisory Centre (VAAC), Bureau of Meteorology, Northern Territory Regional Office, PO Box 40050, Casuarina, NT 0811, Australia (URL: http://www.bom.gov.au/info/vaac/); Badan Nasional Penanggulangan Bencana (BNPB), National Disaster Management Agency, Graha BNPB - Jl. Scout Kav.38, East Jakarta 13120, Indonesia (URL: http://www.bnpb.go.id/); Jakarta Post (URL: http://www.thejakartapost.com/). PVMBG reported an increase of volcanic tremor at Rinjani on 28 April, with a pattern similar to the one recorded just prior to the 27 September 2016 eruption. The Alert Level remained at 2 (on a scale of 1-4); the public was warned not to approach the crater within a 1.5-km radius. Based on satellite and pilot observations, the Darwin VAAC reported that an eruption at Rinjani on 1 August generated an ash plume that rose to an altitude of 9.8 km (32,000 ft) a.s.l. and drifted S. Ash plumes were first visible in satellite images at 1150, and according to PVMBG passengers aboard a plane noted that ash plumes rose 2 km above the crater. BNPB noted that the Lombok International Airport closed at 1655 and was scheduled to reopen at 1000 the next day. Later on 1 August ash plumes rose to altitudes of 4.3-6.1 km (14,000-20,000 ft) a.s.l. and drifted S, SW, and W. No plumes were visible at 1730; conditions had returned to normal levels although BNPB warned that the public should stay at least 1.5 km away from the volcano. PVMBG reported that during 25 October-24 November 2015 white and gray plumes rose as high as 2.6 km above Rinjani's Barujari Crater. Incandescent material was sometimes ejected 30-150 m high. Gray plumes observed during 25 November-24 December rose as high as 2.5 km. During 25 December 2015-18 January 2016 white plumes rose 50 m above the crater. Seismicity had also decreased to background levels. On 20 January the Alert Level was lowered to 1 (on a scale of 1-4), and the public was reminded not to approach the crater. Based on satellite and ground observations, the Darwin VAAC reported that on 2 and 5 December ash plumes from Rinjani rose to altitudes of 3.7-4.9 km (12,000-16,000 ft) a.s.l. and drifted 25-110 km SW and W.
Based on satellite and ground observations, the Darwin VAAC reported that during 24-30 November ash plumes from Rinjani rose to altitudes of 3.7-4.3 km (12,000-14,000 ft) a.s.l. and drifted as far as 320 km SW and W.
Based on satellite and pilot observations, the Darwin VAAC reported that during 18-23 November ash plumes from Rinjani rose to altitudes of 3-4.3 km (10,000-14,000 ft) a.s.l. and drifted as far as 95 km SW, WNW, and W. A thermal anomaly was visible on 18 November; that same day the VAAC noted that activity had continued to decline. Based on observations conducted at a volcano observation post in the village of Lawang Sembalun, PVMBG reported that during 11-13 November dense white-and-gray plumes rose as high as 2.6 km above Rinjani’s Barujari crater. Elevated levels of continuous tremor were detected by the seismic network, although RSAM values showed a declining trend. Strombolian activity continued to feed N-to-E-trending lava flows. A lava flow entered lake Segara Anak, causing an increase in the lake level and increased flow in the Kokok Putih river. The Alert Level remained at 2 (on a scale of 1-4); visitors and residents were warned not to approach the crater within a 3-km radius. BNPB reported on 14 November that ash plumes rose as high as 1.6 km and drifted WSW; ashfall was reported in some villages downwind. The report also noted that flight conditions were normal at the airport. Based on satellite observations, the Darwin VAAC reported that during 15-17 November ash plumes rose to altitudes of 3.7-4.3 km (12,000-14,000 ft) a.s.l. and drifted as far as 240 km NW, WNW, W, and SW.
PVMBG reported that after an eruption occurred at Rinjani on 25 October tremor amplitude increased, and was continuous from 1109 on 2 November through 0600 on 5 November. During 25-31 October dense white emissions rose 900 m above Barujari Crater. During 1-5 November dense gray-to-brown ash plumes rose as high as 1.6 km above the crater. The webcam showed incandescent material being ejected from the crater on 4 November. The Alert Level remained at 2 (on a scale of 1-4); visitors and residents were warned not to approach the crater within a 3-km radius. Based on a 9-November PVMBG notice, BNPB reported that a lava flow had traveled 1 km E of the crater, towards the Koko Putih River. Incandescent material was ejected 750 m above the crater and ash plumes rose 2.5 km. Based on satellite observations and pilot observations, the Darwin VAAC reported that during 4-10 November ash plumes rose to altitudes of 4.3-6.1 km (14,000-20,000 ft) a.s.l. and drifted as far as 740 km NW, W, SW, and S.
According to news articles, Ngurah Rai International Airport in Bali reopened on 9 November but some international flights had remained canceled; the airport had closed the evening before. The closure of Lombok International Airport had been extended until 10 November. Based on satellite observations and information from PVMBG, the Darwin VAAC reported that on 31 October an ash plume from Rinjani rose to an altitude of 3 km (10,000 ft) a.s.l. and drifted W before it detached. During 1-3 November ash plumes rose to altitudes of 2.7-4.3 km (9,000-14,000 ft) a.s.l. and drifted as far as 350 km NW, W, WSW, and SW. BNPB reported that on 3 November ash plumes rose as high as 1 km above Barujari Crater and drifted W; ashfall was reported in seven villages in North Lombok. According to a November news article, ash plumes that drifted W and SW caused three airports to close during 3-4 November: Ngurah Rai (150 km WSW) in Bali, Selaparang Airport (40 km WSW) in Lombok, and Blimbingsari Airport (230 km W) in Banyuwangi, East Java. On 4 November BNPB reported that ash plumes rose to an altitude of 4.3 km (14,000 ft) a.s.l. and drifted W and SW.
PVMBG reported that on 25 October at 1004 an eruption at Rinjani generated an ash plume that rose 200 m above the Barujari crater, inside the caldera. Ash fell on the flanks, especially to the SW. The report noted that no seismic nor surficial precursory events were detected. The Alert Level was raised to 2 (on a scale of 1-4). Based on satellite observations, the Darwin VAAC reported that on 26 and 28 October ash plumes rose to altitudes of 3-4 km (10,000-13,000 ft) a.s.l. and drifted 45-75 km SW and WSW. CVGHM reported that during June-15 November seismicity from Rinjani decreased; visual observations indicated no activity since August. On 19 November the Alert level was lowered to Normal, or 1 (on a scale of 1-4). According to news articles, three eruptions from Rinjani during 22-23 May were accompanied by tremors. Ash and incandescent material was ejected as high as 2 km. Ash plumes drifted 12 km and caused ashfall in multiple areas. Lava flowed into the caldera lake and caused the lake water temperature to rise from 21 to 35 degrees Celsius. Based on analysis of satellite imagery, the Darwin VAAC reported that on 5 May a possible ash plume from Rinjani rose to an altitude of 5.5 km (18,000 ft) a.s.l. and drifted 150 km NW. The plume was not seen in imagery about six hours later. CVGHM advised the VAAC that intermittent activity could produce ash plumes to 1.5 km (5,000 ft) above the caldera. CVGHM reported that observers at a post located 12.5 km NE of Rinjani saw one whitish-colored plume that rose 100 m from the volcano during February. Dense whitish plumes (and possibly brown) rose 500-900 m in March on 26 occasions and as high as 1,500 m in April on 41 occasions. Plumes seen on 1 and 2 May were "chocolate" in color and rose a maximum height of 1,600 m. From February through April seismicity decreased, although the maximum amplitude of earthquakes increased. CVGHM also noted that ash eruptions and ejected incandescent material fell within Rinjani caldera, but some ash was blown out of the caldera. The Alert Level was raised to 2 (on a scale of 1-4) on 2 May. Based on a pilot report, the Darwin VAAC reported that on 2 January an ash plume from Rinjani rose to an unspecified altitude. The plume was not identified in satellite imagery; however a meteorological cloud was present in the area. Based on analysis of satellite imagery, the Darwin VAAC reported that during 11-12 and 16 June ash plumes from Rinjani rose to an altitude of 4 km (13,000 ft) a.s.l. and drifted 15-55 km W and WSW. CVGHM reported than during 29 April-2 May seismicity from Rinjani increased and tremor was detected. On 2 May, an eruption produced dense brown "smoke" that rose 1 km from Barujari cone and was accompanied by a booming noise. On 4 May, an eruption of ash produced a white to brown plume that rose 500-700 m above the cone and drifted N. Fog often prevented observations. The Alert Level was raised to 2 (on a scale of 1-4). According to a news article, ash fell in the local village of Senaru. An eruption occurred at Rinjani on 1 October at 1730 following an increase in seismicity that began on 5 September (0-7 earthquakes occurred per day). DVGHM raised the Alert Level to 3 (on a scale of 1-4) or Orange. During 2-4 October, explosions produced thick gray ash plumes to heights of ~300-800 m above the post-caldera cone, Barujari. The explosions occurred on the NE slope of Barujari cone every 5 to 160 minutes. Seismicity was dominated by explosion earthquakes. Based on information from DVGHM, the Darwin VAAC reported that an eruption at Rinjani on 1 October at 0530 produced a plume to ~600 m above the volcano's summit. No ash was visible on satellite imagery. The volcano was at Aviation Color Code Orange. Visual observations revealed that eruptions on 5 October reached ~4.5 km a.s.l. A news article reported that hikers were banned from climbing the volcano, but the evacuation of villagers near the volcano was deemed unnecessary by local officials. Rinjani volcano on the island of Lombok (figure 1) is second in height among Indonesian volcanoes only to Sumatra's Kerinci volcano. Figure 1. Black-and-white reproduction of a Space Shuttle infrared photograph of Lombok Island and Rinjani sometime during 7-16 May 1992. The elevation-controlled shading is thought to reflect vegetation zones. NASA photograph number STS-49-97-051. In May a glow was noticed on the crater floor of Barujari cone, which has undergone no significant activity since August 1966. A portable seismograph (PS-2) and telemetry seismograph (Teledyne) were put into operation on 27 May and 9 June, respectively. One volcanic earthquake event/day was recorded on 27, 28, 30, and 31 May. After 4 June, however, volcanic tremor with a maximum amplitude of 35 mm was recorded, presumably associated with the upward movement of magma. At 0200 on 3 June, Barujari cone began erupting by sending an ash plume 500 m high. One 8 June press report described emission of "smoldering lava" and "thick smoke," as well as ashfall in nearby villages from an ash cloud rising 1,500 m above the summit. Between 3 and 10 June, up to 172 explosions could be heard each day from the Sembalun Lawang volcano observatory (~15 km NE). During this period, seismic data indicated a dramatic increase in the number of explosions per day, from 68 to 18,720 (figure 2). Eruptions were continuous at least through 19 June, with maximum ash plume heights of 2,000 m on 9-11 June (figure 2). Figure 2. Daily number of explosion earthquakes and height of the ash plume at Rinjani, 3-19 June 1994. Courtesy of VSI. The ash plume generally drifted SE, depositing up to 30 mm of ash on the island (figure 3). Strombolian eruptions ejected pyroclastic material <2 m in size as high as 600 m above the vent; this material fell in a restricted proximal area around the cone and in the lake. Lava flows began on 8 June and partially covered previous lava flows from Rombongan (in 1944) and Barujari (in 1966) (figure 4). Figure 3. Distribution of ash from Rinjani eruptions, 3-19 June 1994. Courtesy of VSI. Figure 4. Segara Anak caldera lake at Rinjani showing lava flows from the Rombongan dome (1944), Barujari cone (1966), and the recent lava flows of June 1994 (slash pattern). Courtesy of VSI. A series of aircraft warnings based on pilot reports and weather satellite images indicated much larger plumes than suggested by the ground observations. First, an eruption at about 1200 on 7 June produced a long plume that caused a large number of aviation warnings. The plume, located on satellite imagery, extended 120 km S of Rinjani and was beginning to disperse by 1530. A pilot report at 1645 on 7 June indicated a "smoke" plume to 13.5 km altitude moving ESE, but by 2345 the plume was indistinguishable on satellite imagery. The imagery showed a plume around 0633 on 8 June, which extended at least 83 km SE of the volcano. Aircraft were advised to avoid this area to an altitude of 10.5 km (35,000 feet). Second, at 1645 on 9 June a cloud with volcanic ash was evident on satellite imagery within 56 km of the volcano rising up to an altitude of 4.5 km (15,000 feet). The plume was apparently not elongated on the image but the report stated: "Expect cloud to drift W."
In apparent conflict with ground observations and satellite imagery observed by Australian meteorologists, a GOES satellite image at 1831 on 9 June obtained by Steve Matthews revealed a N-directed plume. This straight, distinct plume originating from Lombok Island trailed N for 800 km over SE Borneo, where it merged with a dense cloud bank. The plume widened from ~50 km across at a point 100 km N of the island to 100 km across where it met the Borneo coast. Satellite imagery at 0830 on 10 June indicated a cloud with ash from 74 km SE to 56 km NW of the volcano to an altitude of 9 km (30,000 feet) with upper level drift to the S. Between 1700 and 2330, an ash cloud (bounded by the following corner points: 8°S, 116°E; 8°S, 117°E; 10°S, 117°E; and 12°S, 118.5°E) reached a height of almost 10 km (34,000 feet). The tongue of ash cloud previously detected drifting S was no longer evident on satellite imagery by 0600 on 11 June, but at 1940 the ash cloud was detected within an area slightly smaller than the previous day. The plume, as seen on satellite imagery at 0800 on 13 June through about 0500 on 16 June, remained over the vicinity of the island, but it exhibited some streaming to the N. At that time the plume began streaming E before drifting N. Pilot reports indicated a plume to 7.5 km (25,000 feet), with patches to 10.5 km (35,000 feet) and spreading N and NE. On 17 June, islands could be seen through the thin plume on satellite imagery. Enhanced AVHRR imagery indicated the probable presence of ash within the plume through 1300 on 18 June. Pilot reports at ~1200 on 18 June again confirmed an ash "smoke" cloud SW of the volcano for a distance of 80 km and an altitude of 10 km (34,000 feet). The plume was consistently observed on the imagery during the night of 18-19 June, but remained thin. Information Contacts: W. Tjetjep, VSI; BOM Darwin, Australia; S. Matthews, Univ of Bristol, UK; UPI; ANS. The eruptions continued at least into early July. Observations of early June plumes indicated that they drifted in several different directions; a computer simulation confirmed several directions of drift but failed to confirm an ~800-km-long, N-trending plume suggested by satellite data. Near-source ash deposited on Lombok Island indicated a plume trajectory toward the SE (figure 3). As yet, there are no reports of ash deposited at substantial distances from the Island, suggesting that the broad-scale plume trajectory has to be studied by other means. Also, at present there appears to be little information on plume height or eruption chronology and duration. Reports from aviators and meteorologists described the plume on 9-11 June as drifting in a range of directions, mostly toward the S and E (figure 5). There were two drift direction observations that differed. An apparently minor deviation took place on 10 June, when the plume drifted NW and N of the volcano (arrow and parts of shaded areas, 10-11 June, figure 5). A report of a substantially different plume trajectory (19:05) came from an interpretation of a GOES satellite image taken at 1831 on 9 June, which suggested a comparatively straight, N-directed plume extending ~800 km over SE Borneo (figure 5). Figure 5. Composite of reported plume locations for 9-11 June 1994 (various shading and arrow patterns reflect different reports). The figure includes meteorological reports as well as data from 19:5 compiled by Nick Heffter. For comparison to other available observations Nick Heffter modelled the transport and dispersion of Rinjani's June ash plumes. He used software titled "Volcanic Ash Forecast, Transport, and Dispersion (VAFTAD)" to simulate plume trajectories (Heffter and Stunder, 1993; 1994). VAFTAD was developed at the Air Resources Laboratory of NOAA for rapid response to an eruption even when some of the details such as the total mass injected into the atmosphere or the distribution of mass with respect to height in the eruption column are unknown. The cited paper gives references for several other different modeling schemes, some of which emphasize ash transport, ash concentrations and mass, and fallout along the centerline of the eruption. The VAFTAD model focuses on hazards to aircraft by forecasting the visual ash cloud location in time and space. Since VAFTAD is tailored towards the aviation community, one role of the output is to aid the forecaster in issuing significant meteorological (SIGMET) advisories. A second role . . . is the depiction of volcanic ash hazard to aircraft for several days after the eruption. Although access is currently limited to qualifying agencies and universities, VAFTAD is user run, at any time, via dial-up modem to a workstation at the Air Resources Laboratory. On-screen prompts request the volcano's coordinates, eruption date and time, and the initial eruption cloud height. The computer automatically faxes output charts of the forecast visual cloud to pre-designated recipients via dial-up fax, and makes charts available for dissemination over various fax circuits (eg. DIFAX). VAFTAD uses wind and pressure data updated two or more times a day and incorporates grid points with spacings of 91 km in the USA and 1 degree over the rest of the globe. The model assumes a mass load to the atmosphere of 1 gram composed of spherical particles with a specific gravity of 2.5 in a size range of 0.3-30 µm in diameter. VAFTAD computes transport and dispersion assuming particles are carried by advection both horizontally and vertically, and a slip correction allows particles to fall in a lateral direction. Figure 6 shows a sample of some of the results of trials for the early June Rinjani eruption. Here the VAFTAD modeling software was applied in analysis mode (in other words, after the eruption, rather than in the forecast mode, before the eruption). The charts shown are enlarged and cropped from output similar to those automatically faxed from user-run forecasts. Figure 6 (top) presents some of the results for a modeled eruption starting at 0700 on 7 June (defined as t = 0 hours). Plume location estimates (solid boxes) are given for 6 and 12 hours after the eruption started. In harmony with the bulk of the observations summarized on figure 5, the simulations on 7-10 June (figure 6, bottom) show the majority of the plume traveling towards the S and E, with some significant dispersal towards the NW as well. In contrast, VAFTAD simulations for this time period failed to substantiate the extensive N-drifting plume. Perhaps the apparent northward plume trajectory on the GOES image was caused by similar-looking weather clouds. Almost a month after the initiation of the eruption observers continued to see plumes extending from the volcano (table 1). Table 1. Comments and coordinates describing the Rinjani ash plume taken from volcanic advice to aviators issued from Darwin, Australia, 4-8 July 1994. Note that in addition to the coordinates given, one end of the plume also remained attached to Rinjani. 04 Jul 1994 1847 Polygonal area: (a) 8.9°S, 115.5°E; (b) 8.5°S,113.0°E; and (c) 7.98°S, 113.0°E. 05 Jul 1994 0600 Triangular area: (a) 8.0°S, 115.0°E; and (b)7.5°S, 115.5°E. 05 Jul 1994 1630 Streaming toward the NW (reaching as far as6.5°S, 113.3°E). 05 Jul 1994 1825 Polygonal area : (a) 8.0°S, 115.4°E; (b) 7.7°S,115.1°E; and (c) 6.9°S, 115.4°E. 07 Jul 1994 2200 "No significant plume or evidence of ash cloud[located] directly overhead [at] Rinjani volcano. No ground-based reports or recent AIREPS [spoken weather reports by airborne weather crew] available." 08 Jul 1994 0625 Enhanced imagery showed: "no significant plume or evidence of ash other than directly overhead. No ground-based reports or recent AIREPS available. In light of the above no further advices will be issued until further activity is observed or new information suggests that Rinjani has again become active." 08 Jul 1994 1517 Meteorologists at Darwin received an AIREP indicating "smoke near the volcano." 08 Jul 1994 1900 Enhanced imagery showed no significant plume or ash cloud. References: Heffter, J.L., and Stunder, B.J.B., 1993, Volcanic Ash Forecast Transport and Dispersion (VAFTAD) model: Weather and Forecasting, v. 8, no. 4, p. 533-541. Heffter, J.L., and Stunder, B.J.B., 1994, Brief description of the Volcanic Ash Forecast Transport and Dispersion (VAFTAD) model: unpublished manuscript (updated version, July 1994). Information Contacts: J. Heffter, NOAA Air Resources Laboratory; BOM Darwin, Australia. An eruption in June (19:05) sent ash plumes 2,000 m above the summit, resulting in ashfall on nearby villages. Activity of some kind was apparently continuing in late October. A NOTAM from the Bali FIR reported a volcanic ash cloud up to 900 m above the summit, with an average of one eruption per day. On 3 November, a cold lahar from the summit area traveled down the Kokok Jenggak River. Thirty people from the village of Aikmel who were collecting water from the river were killed; one person remained missing as of 9 November. No damage to the village was reported. Local volcanologists noted that additional lahars could be triggered by heavy rainfall. Information Contacts: UNDHA; BOM Darwin, Australia. A NOTAM about volcanic activity from Rinjani was issued by the Bali Flight Information Region on the morning of 12 September. An ash cloud was reportedly drifting SW with the cloud top around 4 km altitude. As of 1200 that day, Australian meteorologists had not observed a significant plume on satellite imagery. Synoptic Analysis Branch analysts detected no ash cloud on either visible or infrared GMS imagery. However, at 1600 the Bureau of Meteorology in Darwin advised aviators that a weak low-level plume was intermittently evident on satellite imagery as far as 28 km SW of the volcano. Information Contacts: BOM Darwin, Australia; SAB. Rinjani had increases in some monitored parameters and hazard status during this report interval, covering much of 2004 through 30 January 2005. An eruption occurred on 1 October 2004. We previously presented a brief aviation report concerning an unconfirmed ash cloud from Rinjani in September 1995 (BGVN 20:10). In their text associated with recent reporting used here, The Directorate of Volcanology and Geological Hazard Mitigation (DVGHM) noted that Rinjani's last explosions occurred during 4 June 1994-January 1995. Those explosions came from Barujari volcano (see Background for morphologic information). On 27 September 2004 a DVGHM report noted the decision to increase Rinjani's hazard status to Alert Level II (Yellow, on a scale with the most hazardous at IV). During the last third of 2004, the number of volcanic and tectonic earthquakes had increased. Their increase followed a rise in the number of tectonic earthquakes that began 18 August 2004. Tremor registered on 23, 24, 25, and 26 September 2004. Tremor amplitudes ranged between 12 and 13.5 mm, and the duration of the tremor stood between 94 and 290 seconds. At 0530 on 1 October 2004 Rinjani clearly erupted. The observation station where visual monitoring occurs (Sembalun Lawang) lies in a spot where the caldera wall blocks views into the active zone, so a smaller eruption might have been missed. The eruption caused authorities to immediately raise the hazard status to Alert Level III (Orange). Further details have not emerged regarding the initial 1 October eruption. During the next few days of eruptions, the lake Segara Anak remained undisturbed. During 2-5 October 2004 continued explosions sent ash columns ~ 300 to 800 m above the summit. Gray, thick ash columns drifted to the N. Detonation sounds accompanied every explosion. Successive explosions occurred at intervals of 5 to 160 minutes. Explosions vented on the NE slope of Barujari volcano. Some material also vented from Barujari's peak, however, and fell down around its edifice. A press report in the Jakarta Post indicated that evacuations were not considered necessary. Available monthly seismic data appears in table 2. Seismicity was dominated by explosion earthquakes with maximum amplitudes of 30 mm. Explosion and emission signals were common during February and March 2004 and became absent or unreported after April 2004. Data were unavailable for October 2004 when known eruptions occurred. Table 2. Available seismicity at Rinjani during 10 February 2004 to 30 January 2005. The symbol " - " means not reported. Courtesy of VSI. During 24 to 30 January 2005, gas plumes remained less than 600 m tall. The tremor record had a maximum amplitude of 1.5 mm. Information Contacts: Directorate of Volcanology and Geological Hazard Mitigation (DVGHM), Jalan Diponegoro 57, Bandung 40122, Indonesia (URL: http://www.vsi.esdm.go.id/); The Jakarta Post, Indonesia (URL: http://www.thejakartapost.com/). Eruptions at Rinjani (figures 8 and 9) between October 2004 and January 2005 (BGVN 30:02) was the first activity noted since September 1995. On 29 April 2009, the Center of Volcanology and Geological Hazard Mitigation (CVGHM) again detected an increase in earthquakes and tremor, with eruptions from Barujari's cone beginning 2 May 2009 and continuing through 21 June 2009. Figure 8. Map of Rinjani National Park's campsites and relative elevations. Courtesy of Rinjani Trek Centre (RTC). Figure 9. Diagram of Rinjani showing the Barujari volcanic cone surrounded by Lake Segara Anak. Courtesy of Bohari Adventures. According to a 4 May news article in the Jakarta Post, the first 2 May eruption consisted of four tectonic earthquakes, each lasting between 70 and 120 seconds. Heriyadi Rachmat, head of the East Nusa Tenggara province's mining, energy and mineral resources agency, stated in the article that "the peak of the activity was on Saturday 2 May with four tremors and the eruption of thick ash." This activity prompted CVGHM to raise the Alert Level from 1 to 2 (on a scale of 1 to 4). The head of the Mt. Rinjani National Park confirmed that, as of 3 May, the park had been officially closed to hikers. At that time, around 50 hikers were asked to come down from the mountain. Rinjani, a popular tourist destination, attracts an average of 9,000 hikers per year, 4,000 of whom are foreigners. During May and June 2009, seismic activity consisted of numerous eruption signals, while observers saw ash plumes, incandescent material, and lava flows (table 3). CVGHM recorded the largest numbers of seismic signals between 7 and 31 May. In detail, during that interval there were 1,897 eruptive earthquakes, 2,163 low-frequency earthquakes, 1,341 harmonic tremor episodes, 3,249 air blasts, 17 shallow volcanic earthquakes, 39 deep volcanic earthquakes, seven local tectonic earthquakes, and three long-distance tectonic earthquakes. Although the volcano was frequently obscured by fog, people still saw impressive eruptions from the observation post at Sembalun Lawang. They noted continuous eruptions with ejected glowing material reaching 200 m in height above the vent, and thrown laterally out to a radius of 500 m from the summit. A great amount of ash, cinders, and incandescent material fell into the caldera, while smaller fragments were blown away. Table 3. Earthquakes, tremor (both harmonic and non-harmonic with variable maximum amplitudes and durations), air blasts, and other observations between 2 May and 21 June 2009. Key: LD is long distance tectonic, SV is shallow volcanic, LT is local tectonic, DV is deep volcanic. Courtesy of CVGHM and the Darwin VAAC. 02 May 2009 -- -- -- -- -- Dense brown ash plume to 4.7 km altitude; booming noise. 03 May 2009 21 13 -- -- -- Recorded during 1800-2400. 04 May 2009 85 12 1 7 1 LD Ash eruption produced white to brown plume to 4.2-4.4 km altitude, drifting N.
07 May 2009 92 43 29 88 -- Recorded between 0000 and 1800; thick white plume. 07-31 May 2009 1,897 2,154 1,341 3,249 17 SV, 39 DV, 7 LT, 3 LD 163 eruptions with dense white and gray plumes rising to 3.8-4.1 km altitude. 07-15 Jun 2009 -- Continuous -- -- 3 DV Dense white plumes to 1.3-2.7 km altitude. 16 Jun 2009 -- Continuous -- -- 1 LD Dense white plumes to 1.3-1.5 km altitude. 21 Jun 2009 -- -- -- -- -- Ash plumes to altitude of 3.0 km; drifted N.
Lava flowed into the caldera lake and then extended 100 m beyond the shoreline. CVGHM and Darwin Volcanic Ash Advisory Center (VAAC) reports also noted several ash plumes over the summit, including those of dense white and grayish color that rose 50-400 m above Sembalun Lawang observatory from 7 May through 29 May. Potential hazards. As of 16 June 2009, the status of Rinjani remained at Alert Level 2. CVGHM recommended remaining at least 4 km from the Barujari vent, noting potential risks from ashfall and incandescent rocks both within the caldera and in the surrounding areas (figure 10). In addition, CVGHM cautioned that landslides could enter Lake Segara Anak, causing an overflow that could form lahars. Figure 10. A hazard map showing risk areas at Rinjani. Note the lahars extend beyond the two concentric circular areas, reaching the sea on the N to NW outer flanks. Date of publication and exact details of authorship uncertain. Courtesy of CVGHM. Information Contacts: Center of Volcanology and Geological Hazard Mitigation (CVGHM), Jalan Diponegoro 57, Bandung 40122, Indonesia (URL: http://vsi.esdm.go.id/); Darwin Volcanic Ash Advisory Centre (VAAC), Bureau of Meteorology, Northern Territory Regional Office, PO Box 40050, Casuarina, NT 0811, Australia (URL: http://www.bom.gov.au/info/vaac/); The Jakarta Post (URL: http://www.thejakartapost.com/news/2009/05/04/mt-baru-jari-spews-ash.html); Rinjani Trekking Centre, Jalan Barakuda 10, BTN Griya Batu Bolong Senggigi, Senggigi-West Lombok 83355, Lombok-NTB-Indonesia (URL: http://www.rinjanimountain.com/rinjani-information-center.htm); Bohari Adventures, Jalan Cendrawasih 8, Cakranegara Mataram 83231, Lombok-NTB-Indonesia (URL: http://www.trekkingrinjani.com/). A series of eruptions at Rinjani began on 2 May 2009 (BGVN 34:06). The current report, provided by Alain Bernard, presents additional data regarding these eruptions, which continued through 31 August 2009. 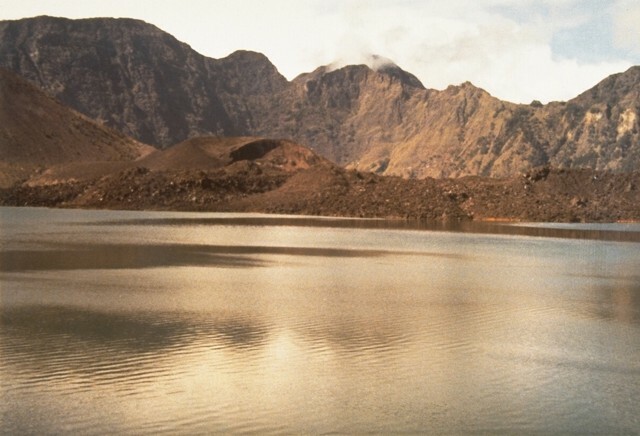 Studies of Rinjani volcanic lake are part of a cooperative agreement between Indonesia and Belgium, a collaboration funded by the Commission Universitaire pour le Développement (CUD, the main Belgian development cooperation agency for universities). Geochemical and physical studies of the Segara Anak lake started in the framework of this collaborative effort during the summer of 2006. During the summer of 2008, investigators installed a monitoring station for continuous measurements of the lake's level and temperature, and for meteorological parameters. The scientific teams involved in this study were (Indonesia) Akhmad Solikhin, Devy Syabahna and Syegi Kunrat of the Center of Volcanology and Geological Hazards Mitigation (CVGHM); (Belgium) Alain Bernard, Benjamin Barbier, Robin Campion, and Corentin Caudron of the Université Libre de Bruxelles (ULB), and Vincent Hallet and David Lemadec of the Facultés Universitaires Notre Dame de la Paix (FUNDP). Segara Anak lake. 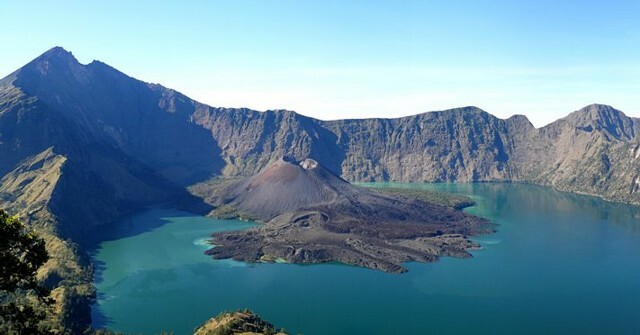 The majestic Segara Anak lake filling the caldera of Rinjani covers an area of 11 km2. Prior to the 2009 eruption, the lake's volume was 1.02 km3. The lake-surface elevation is ~ 2 km (figures 11 and 12). Figure 11. Bathymetric map of Rinjani's Segara Anak lake made from 65 km of echo-sounder surveys conducted in 2007 and 2008. Maximum depth of the lake is 205 m. Courtesy of the CVGHM, ULB, and FUNDP study team. Figure 12. Topographic map of Rinjani caldera from Bakosurtanal-Indonesia (National Coordinator for Survey and Mapping Agency, Indonesia). Margins defining squares are 1 km long. "CTD" and "CTD-B" are locations of conductivity-temperature-depth profiles. "Meteo" is the site of the meteorological station monitoring air temperature, humidity, wind velocity, and net solar flux. The labels 51-54 are locations of hot springs discussed below. Courtesy of the CVGHM, ULB, and FUNDP study team. The lake is neutral (pH: 7-8) and its chemistry dominated by chlorides and sulfates with a relatively high concentration of total-dissolved solids (TDS: 2,640 mg/L). This unusually high TDS value and lake surface temperatures (20-22°C), well above ambient temperatures (14-15°C) for this altitude, reflects a strong input of hydrothermal fluids. Numerous hot springs are located along the shore at the foot of the Barujari cone. Bathymetric profiles showed several areas with columns of gas bubbles escaping from the lake's floor. Precursory signals of the May 2009 eruption. Changes in Segara Anak lake and the hot springs before the first 2 May 2009 eruption included significant anomalies in the temperature and chemistry of the hot springs. During field work 10-14 April 2009, the researchers noted an increase in temperature and acidity of hot springs 53 and 54 (figures 13-14) compared to July. This increasing acidity was confirmed in the lab as the consequence of an increase in sulfate levels not observed during studies since 2004. Figure 13. Geochemistry of Rinjani's Segara Anak lake (from CTD locations, figure 12) and hot springs. NA signifies not analyzed. Courtesy of the CVGHM, ULB, and FUNDP study team. Figure 14. A plot of 2004 to 2009 sulfate (SO42-) ion concentration versus pH. Note the April 2009 increase in the acidity and sulfate contents of Rinjani's hot springs 53 and 54 (upper left). Courtesy of the CVGHM, ULB, and FUNDP study team. The Fe-ion concentrations in spring 54, usually below detection limits, peaked at 120 mg/L. This change in chemistry produced a yellowish-brown coloration of the lake waters because of the precipitation of ferric hydroxide, Fe(OH)3 (figures 15-16). An ASTER image from 21 August 2009, processed to enhance the Fe(OH)3 precipitates, revealed a chemical plume close to where hot springs 53 and 54 injected water into the lake. Figure 15. The Rinjani lake shoreline seen at a point close to the hot spring 54 on 12 April 2009. The water has a brown color and the coating on the rocks is an amorphous ferric hydroxide that precipitated when hydrothermal fluids oxidized by mixing with the lake waters (yellow-brown in color). Rock discoloration reaches the height of the mans lower hand. Changes in lake level were a consequence of the rainy season. Photo by A. Bernard. Figure 16. 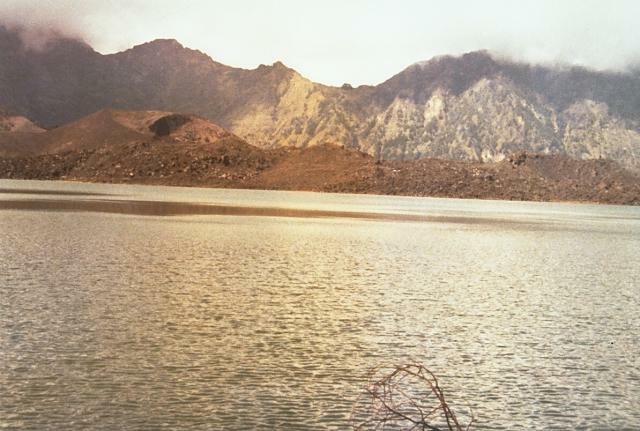 A photo of Rinjani and Segara Anak Lake thought to have been taken on 26 April 2009 but certainly before the start of the eruption. A spectacular yellow-brown chemical precipitate floated on the lake's surface (at left). Copyrighted photo by Jim Chow. A chemical plume of low pH and dissolved oxygen was observed at the lake surface extending up to several hundred meters away from hot spring 54. pH profiles as a function of depth recorded at several locations showed a clear acidification of Segara Anak lake especially at shallow depths (15-20 m) (figure 17). Rainfall in April 2009 caused a shallow zone of higher pH. Figure 17. Plot showing shifts of pH in Rinjani's caldera lake waters with depth. The 2009 profile was recorded in April 2009, and the 2008 profile, in July 2008. Line 2009b was drawn as an estimate of the curve without the rainfall event. Measurements made with an SBE Seacat 19-Plus profiler. Courtesy of the CVGHM, ULB, and FUNDP study team. A slight lake surface temperature increase from 20°C in July 2008 to 22°C in early April 2009 was mostly attributed to meteorological effects. Large increases seen in lake level in January and February 2009 were the consequence of heavy rainfalls. Heating of the lake between August 2008 and April 2009 occurred mainly during periods with reduced heat loss to the atmosphere due to less wind. A report of these field observations was made on 17 April to CVGHM, which prompted them to send another team to the volcano. The new team arrived at the summit of the volcano on 2 May 2009, the day the eruptions started. Eruptive activity May-August 2009. The 2009 eruptions originated from the same vent of the October 2004 activity (figure 18), and was characterized by mild eruptions that produced a small lava flow and low altitude, ash-poor gas plumes (figure 19). Contrary to that reported in some newspapers, the 2009 eruption did not open a new vent. Figure 18. This July 2006 photo of Rinjani illustrates the new vent that opened on the NE slope of Gunung Baru in 2004 and then produced a short lava flow. The 2009 eruptive activity at Rinjani started from this same vent, producing a significant lava flow that entered the crater lake and built a delta. Photo by A. Bernard (July 2006). Figure 19. Eruption of Rinjani seen on 10 June 2009. The plume at this point was relatively small and lava proceeded N to enter the lake. Photo by R. Campion. Alain Bernard sent a report by Robin Campion (ULB) who was on site June 2009. According to Campion, mild activity was observed from the SE rim during 9-11 June. Pressurized incandescent gas was released at a 1-2 second intervals from a vent located in the 2004 crater, on the S flank of Barujari. At variable intervals (10 seconds to 10 minutes), stronger gas jets ejected lava fragments to heights up to 100 m. Occasional ash ejections occurred from a second vent in the same crater. A third lower vent emitted a viscous lava flow that reached Segara Anak Lake. Contact between the lake and the lava delta resulted in a warm surface current (figure 20). Figure 20. A 10 June 2009 FLIR thermal camera image of Rinjani's Barujari cone and Segara Anak lake. A thermal plume of hot lake water was drifting from the lava entry points. Temperature scale is for lake waters. Photo by R. Campion. Figure 21 shows an ASTER satellite image of Rinjani lake-surface temperatures. Increased discharge of the hot springs on the S flank of Barujari produced a distinct plume with an orange-red color. Weak winds carried the steam-and-gas plume (with low ash content) N and W at an altitude of 3-4 km. Activity did not vary during the 3-day observation period. Figure 21. ASTER satellite image of the N part of Rinjani's Segara Anak lake taken on 29 July 2009 (at 1446 UTC). Thermal infrared bands 13 and 14 processed with a split-window algorithm. Contours are in degrees C. Maximum temperature in the lake water was 57°C. Courtesy of the CVGHM, ULB, and FUNDP study team. As of 31 August 2009, the eruption was still underway. At that point, the new lava flow covered an area of 0.65 km2 (figure 22). The shoreline had been significantly modified by the entry of lava into Segara Anak lake, and the lake surface area had been reduced by 0.46 km2 (figures 22 and 23). Figure 22. Rinjani seen in ASTER false color on 21 August 2009 (0235 UTC). The new lava covers an area of 650,000 m2 and significantly changed the shoreline. The inset shows the pre-eruption shoreline and the new lava margin (in red on colored versions). Courtesy of the CVGHM, ULB, and FUNDP study team. Figure 23. Rinjani, in a photo apparently taken on 4 August 2009, showing a new delta built into the lake. Brown waters from hot springs were still visible at the end of the lake and drifted over a large area of the lake. Courtesy of Arjo Vanderjagt. According to Alain Bernard, updates on Rinjani's activity will be posted on the website of the Commission of Volcanic Lakes (CVL, see information contacts). Bernard sent additional figures describing Rinjani behavior as late as 27 September 2009. Information Contacts: Alain Bernard, Benjamin Barbier, Robin Campion, and Corentin Caudron, Université Libre de Bruxelles (ULB), Belgium (Commission of Volcanic lakes, URL: http://www.ulb.ac.be/sciences/cvl/rinjani/rinjani.html); Akhmad Solikhin, Devy Syabahna, and Syegi Kunrat, Center of Volcanology and Geological Hazards Mitigation (CVGHM), Jalan Diponegoro 57, Bandung 40122, Indonesia (URL: http://vsi.esdm.go.id/); Vincent Hallet and David Lemadec, Facultés Universitaires Notre Dame de la Paix (FUNDP, URL: http://www.fundp.ac.be/); Bakosurtanal, Badan Koordinasi Survei dan Pemetaan Nasional (URL: http://www.bakosurtanal.go.id/); Jim Chow (URL: http://www.flickr.com/photos/11668976@N06/3486237730); Arjo Vanderjagt, Oude Boteringestraat 52, 9712 GL Groningen, The Netherlands (URL: http://www.flickr.com/photos/87453322@N00/3794836615). In May and June 2009 (BGVN 34:06) the Center of Volcanology and Geological Hazard Mitigation (CVGHM) detected an increase in earthquakes and tremor, with eruptions from Barujari's cone within the Rinjani caldera. Later reports documented activity through August (BGVN 34:09). In recent years thermal anomalies on the island had been seen (using MODVOLC data) only during September and October 2006 (2-3 days each month), September and October 2007 (1 day each), and August-October 2008 (1 day each). However, the 2009 eruption was clearly recorded. MODVOLC thermal alerts appeared frequently from May to October 2009, being detected on 17-25 days each month (table 4). Activity declined in November and December 2009, with no anomalies in January, but with alerts again seen on 4 and 18 February 2010. Table 4. Number of days with MODVOLC thermal alerts at or near the Rinjani caldera, May 2009-February 2010. Courtesy of the Hawai'i Institute of Geophysics and Planetology (HIGP) Thermal Alerts System. Information Contacts: Center of Volcanology and Geological Hazards Mitigation (CVGHM), Jalan Diponegoro 57, Bandung 40122, Indonesia (URL: http://vsi.esdm.go.id/); Hawai'i Institute of Geophysics and Planetology (HIGP) Thermal Alerts System, School of Ocean and Earth Science and Technology (SOEST), Univ. of Hawai'i, 2525 Correa Road, Honolulu, HI 96822, USA (URL: http://modis.higp.hawaii.edu/). Thermal anomalies on Rinjani island previously reported (BGVN 35:01) continue to be recorded by MODIS and caused alerts on the MODVOLC system. Between 1 January and 26 November 2010, MODVOLC thermal alerts occurred on 4, 18, and 27 February, 11 and 29 April, and 1 and 20 May. On 18 February, 9 and 22 pixels were recorded by the Terra and Aqua satellites, respectively. The Center of Volcanology and Geological Hazard Mitigation (CVGHM) reported variable seismic activity during February-April 2010 (table 5), with "white to brown" emissions reaching 50-1500 m above the crater; the number of emissions increased each month, with 1, 26, and 41 emissions reported during February, March, and April, respectively. Table 5. Summary of seismic events recorded at Rinjani, February-April 2010. Courtesy of CVGHM. During 1-2 May, 4-6 eruption earthquakes were registered each day, and dense brown emissions reached 900-1600 m above the crater. The Darwin Volcanic Ash Advisory Centre reported that, on 5 May, a possible ash plume from Rinjani rose to an altitude of 5.5 km and drifted 150 km NW. According to news articles, three eruptions from Rinjani during 22-23 May were accompanied by tremors. Ash and incandescent material was ejected as high as 2 km above the caldera. Plumes drifted 12 km and caused ashfall in multiple areas covering hectares of cropland. Lava flowed into the Segara Anak lake, which lies within the main caldera and caused the lake water temperature to rise from 21° to 35°C. Eruptions were not considered to be at a dangerous level, and evacuations were not ordered. CVGHM reported that, during June through mid-November, seismicity from Rinjani decreased; visual observations indicated no activity since August. On 19 November, the alert level was lowered to 1 (normal, on a scale of 1-4). Information Contacts: Center of Volcanology and Geological Hazard Mitigation (CVGHM), Jalan Diponegoro 57, Bandung 40122, Indonesia (URL: http://vsi.esdm.go.id/); Hawai'i Institute of Geophysics and Planetology (HIGP) Thermal Alerts System, School of Ocean and Earth Science and Technology (SOEST), Univ. of Hawai'i, 2525 Correa Road, Honolulu, HI 96822, USA (URL: http://modis.higp.hawaii.edu/); Darwin Volcanic Ash Advisory Centre (VAAC), Bureau of Meteorology, Northern Territory Regional Office, PO Box 40050, Casuarina, NT 0811, Australia (URL: http://www.bom.gov.au/info/vaac/); RTT News (URL: http://www.abc.net.au/). The Rinjani stratovolcano is located on the island of Lombok, at the western edge of the Lesser Sunda Islands of Indonesia. A large eruption in 1257 CE created a caldera on the W side of the summit crater; Barujari cone emerged there and has been the site of moderate explosive activity and lava flows every few decades since historical recording of the activity began in 1846. 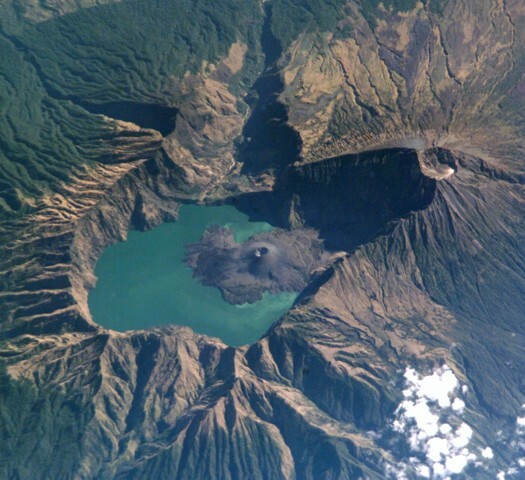 A large crescent-shaped lake, Segara Anak, fills the W portion of the caldera. Rinjani was quiet after eruptions during early October 2004, until 2 May 2009 when activity began again. Thermal anomalies were recorded through 20 May 2010, and the last ash eruptions were reported during 22-23 May, 2010. A new eruption began at Barujari with an ash plume that rose to 3 km altitude on 25 October 2015. Eruptions were nearly continuous until 24 November when activity began to decline; the last ash plume reported by Darwin VAAC was on 5 December 2015, and PVMBG reported ash plumes through 24 December. Lava also flowed down the NE flank of the cone into Lake Segara Anak, raising the water level by one meter. Reports from Indonesia's Pusat Vulkanologi dan Mitigasi Bencana Geologi (PVMBG), or Center for Volcanology and Geological Hazard Mitigation (CVGHM ), National Disaster Management Agency (BNPB), and the Darwin VAAC (Volcanic Ash Advisory Center) are summarized below, along with MODVOLC and MIROVA thermal anomaly and Aura/OMI SO2 emissions data. Indonesian government observations (PVMBG and BPNB). After the last explosions of 22-23 May 2010, seismic activity decreased steadily, and in November 2010 PVMBG reduced the Alert level to Normal or 1 (on a scale of 1-4), citing no activity visually observed since August 2010. There were no more reports of activity from PVMBG until 25 October 2015. The eruption was observed at 1045 local time (figure 24). It generated an ash plume that rose 200 m above the Barujari crater (2,500 m altitude), inside the caldera. Ash fell primarily on the SW flanks of the cone. PVMBG noted that no seismic or surficial precursory events were detected. The Alert Level was raised to 2 (on a scale of 1-4). Figure 24. Eruption of the Barujari cone of Rinjani, 25 October 2015 at 1045 local time (WITA). View from the northern shore of Lake Segara Anak inside the Rinjani caldera. Courtesy of CVGHM (Report, 26 October 2015). In the days following the 25 October eruption, gas, ash, and steam plumes were noted by PVMBG rising 900 m above Barujari. From 1 to 5 November, ash plumes were observed daily rising still higher, to 2,000 m above Barujari, or 4.3 km altitude. The amplitude of the seismic tremors increased after the initial eruption, and continuous tremor began on 2 November, correlating with the observed continuous emissions. The explosions produced ash, pyroclastic fallout around the cone, and a lava flow that traveled down the NE side of the cone and onto the crater floor. Ashfall in seven villages in the North Lombok Regency (the NW quadrant of the island) was reported by BNPB on 3 November, and ash plumes that drifted W and SW caused three airports to close during 3-4 November: Ngurah Rai (150 km WSW) in Bali, Selaparang Airport (40 km WSW) in Lombok, and Blimbingsari Airport (230 km W) in Banyuwangi, East Java. Night incandescence was observed from the webcamera on 4 November. PVMBG recorded a change in seismicity beginning on 2 November, interpreted as indicating a change to more effusive activity and smaller Strombolian-type explosions. Strombolian explosions ejected material 30-150 m above Barujari crater during November. The lava flowing into the lake raised the water level one meter, causing a doubling of the flow rate in the Kokok Putih River (measured 10 km NE of the lake at a hydropower station), but no flooding was reported. PVMBG estimated a VEI of 2 for the eruption. Between 25 November and 25 December 2015, tremor was elevated but not constant, and the signals dropped back down to background levels after 25 December. Plumes of steam and ash continued to be observed through 24 December, rising from 50 to 2,500 m above the crater. From 25 December through 18 January 2016, only white steam plumes rising to 50 m above the crater were observed, prompting CVGHM to lower the Alert Level to 1 on 19 January 2016. Darwin VAAC reports. The first ash plumes from the eruption reported by Darwin VAAC were observed on satellite images late on 25 October 2015, rising to 3 km altitude and drifting 45-75 km SW and WSW. Ash plumes continued rising daily to over 4 km and drifting as far as 350 km NW, W, WSW, and SW into early November. The explosion rate and intensity continued to increase, and an ongoing ash plume was observed during 3-5 November that Darwin VAAC reported was visible at 6 km altitude for over 24 hours; it drifted as far as 740 km generally W and S. Multiple daily VAAC reports of ash plumes were issued through the end of November; altitudes remained generally between 3.7 and 4.3 km, drifting as far as 240 km generally W. A decline in activity was reported on 23 November, and the last VAAC report was on 5 December; the ash plume was reported to be at 3.7 km altitude, drifting 75 km SW. Thermal anomalies and SO2 data. Two 3-pixel MODVOLC thermal anomalies were observed near the summit of Rinjani between late May 2010 and November 2015. The first, on 21 October 2012, was located between the Barujari cone and the summit. The second, on 8 November 2013, was located over the N edge of the caldera rim. Both were within the large summit caldera well, but there were no associated reports of volcanic activity. The first anomaly data from the MODVOLC thermal alerts system that was likely associated with the October 2015 eruption appeared on 2 November 2015 in the area N of Barujari cone where the lava flow was reported. Thermally anomalous pixels were recorded on 20 days through 29 November 2015. The MIROVA (Middle InfraRed Observation of Volcanic Activity) system shows a spike in radiative power in late October, and then records a rapid decline and cessation in the first few days of December 2015 (figure 25). Figure 25. MIROVA (Middle InfraRed Observation of Volcanic Activity) system graph of Log Radiative Power of heat flow from Rinjani between 13 October 2015 and 12 October 2016, showing high levels of radiative power beginning in late October that end around 1 December 2015. Courtesy of MIROVA. Images captured by the OMI instrument on the Aura satellite show the SO2 emissions associated with the eruption. An SO2 anomaly was first captured on 3 November 2015. The strongest, on 8 November (figure 26), measured a mass of 1.190 kilotons of SO2. The last emission clearly associated with Rinjani was acquired on 15 November 2015. Figure 26. Aura/OMI SO2 emission data acquired 8 November 2015 for Rinjani. SO2 mass: 1.190 kilotons; Area: 32422 km2; SO2 max: 5.05 DU at Ion: 116.34 lat: -8.54; 0547 UTC. Images of emissions were captured several times between 3 and 15 November 2015. Courtesy of NASA Goddard Space Flight Center. Information Contacts: Pusat Vulkanologi dan Mitigasi Bencana Geologi (PVMBG, also known as Indonesian Center for Volcanology and Geological Hazard Mitigation, CVGHM), Jalan Diponegoro 57, Bandung 40122, Indonesia (URL: http://www.vsi.esdm.go.id/); Darwin Volcanic Ash Advisory Centre (VAAC), Bureau of Meteorology, Northern Territory Regional Office, PO Box 40050, Casuarina, NT 0811, Australia (URL: http://www.bom.gov.au/info/vaac/); Badan Nasional Penanggulangan Bencana (BNPB), National Disaster Management Agency, Graha BNPB - Jl. Scout Kav.38, East Jakarta 13120, Indonesia (URL: http://www.bnpb.go.id/); Hawai'i Institute of Geophysics and Planetology (HIGP), MODVOLC Thermal Alerts System, School of Ocean and Earth Science and Technology (SOEST), Univ. of Hawai'i, 2525 Correa Road, Honolulu, HI 96822, USA (URL: http://modis.higp.hawaii.edu/); MIROVA (Middle InfraRed Observation of Volcanic Activity), a collaborative project between the Universities of Turin and Florence (Italy) supported by the Centre for Volcanic Risk of the Italian Civil Protection Department (URL: http://www.mirovaweb.it/); OMI (Ozone Monitoring Instrument), Global Sulfur Dioxide Monitoring, Atmospheric Chemistry & Dynamics, NASA Goddard Space Flight Center, Goddard, Maryland, USA (URL: https://so2.gsfc.nasa.gov/). Rinjani volcano on the island of Lombok rises to 3726 m, second in height among Indonesian volcanoes only to Sumatra's Kerinci volcano. Rinjani has a steep-sided conical profile when viewed from the east, but the west side of the compound volcano is truncated by the 6 x 8.5 km, oval-shaped Segara Anak (Samalas) caldera. The caldera formed during one of the largest Holocene eruptions globally in 1257 CE, which truncated Samalas stratovolcano. The western half of the caldera contains a 230-m-deep lake whose crescentic form results from growth of the post-caldera cone Barujari at the east end of the caldera. Historical eruptions dating back to 1847 have been restricted to Barujari cone and consist of moderate explosive activity and occasional lava flows that have entered Segara Anak lake. Foden J D, 1983. The petrology of the calcalkaline lavas of Rindjani volcano, east Sunda arc: a model for island arc petrogenesis. J Petr, 24: 98-130. Lavigne F, Degeai J-P, Komorowski J-C, Guillet S, Robert V, Lahitte P, Oppenheimer C, Stoffel M, Vidal C M, Surono, Pratormo I, Wassmer P, Hajdas I, Hadmoko D S, de Belizal E, 2013. Source of the great A.D. 1257 mystery eruption unveiled, Samalas volcano, Rinjani volcanic complex, Indonesia. Proc Nat Acad Sci, US, 110: 16,742-16,747. Nasution A, Takada A, Udibowo, Widarto D, Hutasoit L, 2010. Rinjani and Propok Volcanics as a heat sources of geothermal prospects from Eastern Lombok, Indonesia. Jurnal Geoaplika, 5(1): 1-9. Varne R, Foden J D, 1986. Geochemical and isotopic systematics of eastern Sunda arc volcanics; implications for mantle sources and mantle mixing processes. In: F-C Wezel (ed), The Origin of Arcs, Amsterdam: Elsevier, 159-189. There is no Deformation History data available for Rinjani. An eruption from a vent on the upper eastern flank of Barujari cone in 1966 produced the barren lava flows that can be seen extending into the caldera lake in this 1973 photo from the NE caldera rim. The flows traveled north into an inlet of Segara Anak (lower right) and south into Segara Endut inlet. 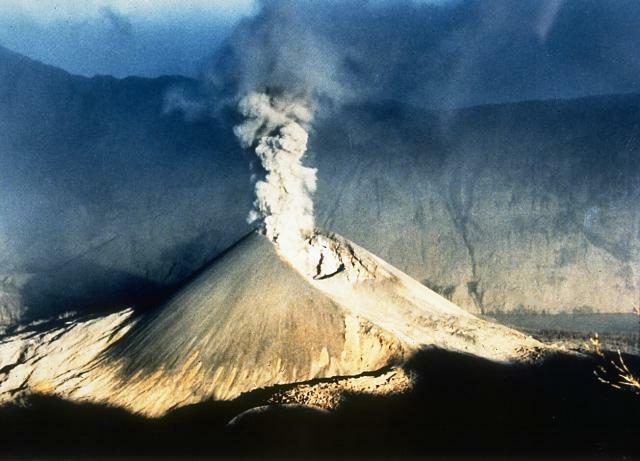 Following a March 28, 1966 earthquake, explosive eruptions formed a new small cone that fed the lava flows, which eventually covered a 600 x 1700 m area. On August 5-8 activity increased, including the emission of a thick eruption cloud. A scientist from the Volcanological Survey of Indonesia makes theodolite measurements along the north rim of the 5-km-wide Segara Anak caldera of Rinjani volcano on Lombok Island. The lobate lava flow entering the lake at the lower left was erupted in 1944 from a vent on the NW flank of Gunung Barujari, a post-caldera cone. 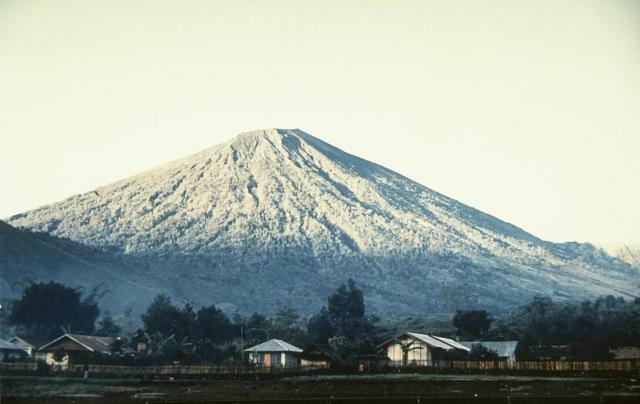 Photo by Sumarna Hamidi, 1973 (Volcanological Survey of Indonesia). The dark-colored lava flow at the left flowed north into the caldera lake from a vent on the upper east flank of Barujari during an eruption in 1966. Lava flows from the same eruption also flowed south into the caldera lake. Gunung Barujari is a large pyroclastic cone constructed on the eastern floor of Segara Anak caldera. The cone rises about 370 m above the caldera lake, and along with flank vents and lava flows forms a large peninsula jutting westward into the lake. The tephra-mantled cone at left-center is the Rombongan lava dome, formed during an eruption in 1944. It was the source of the lava flow that extends to the right (NW) into the Segara Anak caldera lake. Rumblings and thick smoke with nighttime incandescence began on December 25, 1944. A heavy ashfall took place for 7 days, destroying crops and houses. The Rombongan lava dome was emplaced on the NW flank of Gunung Barujari, whose western flank is visible at the left side of the photo. The 1944 eruption that began on Christmas day from a vent on the NW flank of Barujari cone produced the Rombongan lava dome seen on the left center of this photo and a lava flow that extended to the right, forming a peninsula in the Segara Anak caldera lake. Heavy ashfall took place for a week, destroying crops and houses outside the caldera. Rinjani volcano on Lombok Island is one of Indonesia's highest volcanoes, rising to 3726 m. As seen here from the village of Sembalum Lawang to the NE, Rinjani has a symmetrical profile, but its western side is truncated by the 6 x 8.5 km, oval-shaped Segara Anak caldera. Historical eruptions have been recorded since 1847 from Gunung Barujari, a pyroclastic cone within the caldera. 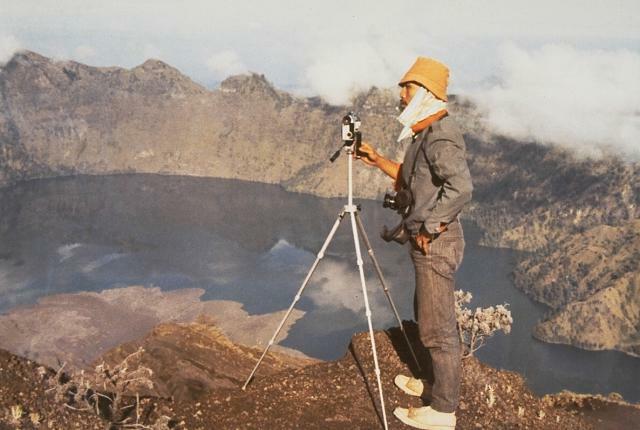 Photo by Willem Rohi, 1989 (Volcanological Survey of Indonesia). 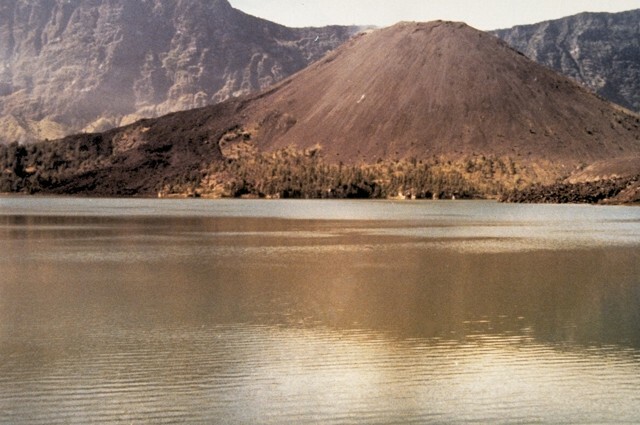 A 2-km-high, double-topped eruption column rises above Barujari cone at Rinjani volcano on June 9, 1994, in this view looking south across the steaming caldera lake with the Segara Anak caldera wall in the background. A small pyroclastic flow can be seen descending from the crater, and the flanks of the cone are steaming from still-hot deposits of a previous explosion. The 1994 eruption began on June 3 and lasted until at least November. 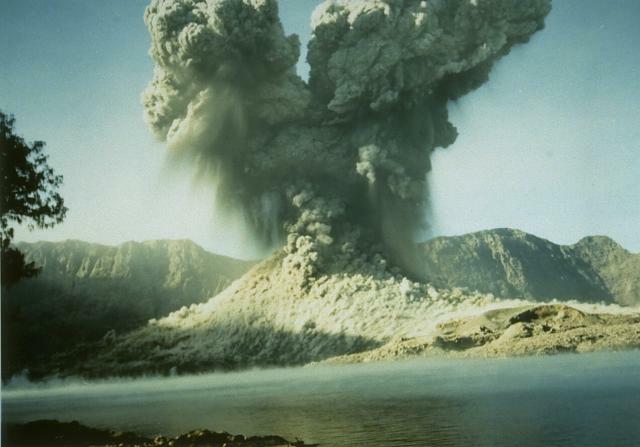 Photo courtesy of Volcanological Survey of Indonesia, 1994. The 2376-m-high Barujari pyroclastic cone, the most prominent post-caldera feature at Rinjani volcano, was formed at the eastern end of the oval-shaped Segara Anak caldera. This 1993 view from the NE rim of the caldera shows a peninsula on the right formed by lava flows from a vent NW of Barujari that entered the caldera lake in 1944 and lava flows on the left side of Barujari that flowed north and south into the lake during a 1966 eruption. 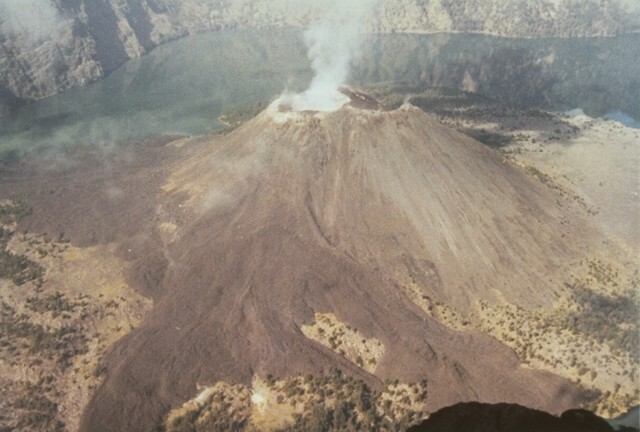 Photo courtesy Volcanological Survey of Indonesia, 1993. An ash column rises above Barujari pyroclastic cone of Rinjani volcano on June 30, 1994, with the southern Segara Anak caldera wall in the background. Intermittent eruptions that took place from June 3 until November or later produced plumes to 3 km height above Barujari's summit and an andesitic lava flow on its northern flank. 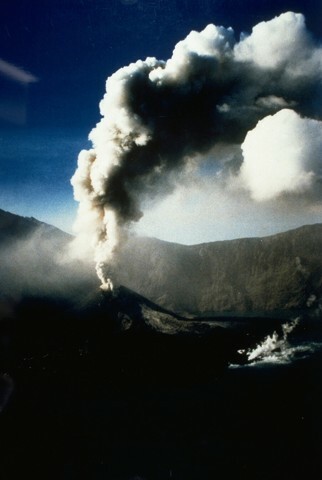 An ash-bearing eruption plume rises on June 30, 1994 above the summit crater of Barujari, a pyroclastic cone on the floor of Rinjani's Segara Anak caldera. Steam rises at the lower right from a lava flow that began erupting during the earlier stages of the eruption, which began on June 3. This spectacular NASA Space Shuttle image with north to the top taken in 2002 shows the 6 x 8.5 km wide Segara Anak caldera, elongated E-W, with a crescent-shaped caldera lake. The post-caldera cone of Baru Jani (New Mountain) has been the source of lava flows that have entered the lake. The 3276-m-high summit of Rinjani (right) is cut by a crater that postdates caldera formation. The majestic Segara Anak lake fills the caldera of Rinjani volcano on Lombok Island. The post-caldera cinder cone is Gunung Baru (new mountain). The summit of Rinjani volcano on the island rises to 3726 m, the second highest of Indonesian volcanoes. The steep-sided conical profile of Rinjani as seen from the east is truncated by the 6 x 8.5 km, Segara Anak caldera. Historical eruptions at Rinjani dating back to 1847 have consisted of moderate explosive activity and occasional lava flows from the post-caldera cone. Photo by Benjamin Barbier, 2007 (Universite Libre de Bruxelles). There are no samples for Rinjani in the Smithsonian's NMNH Department of Mineral Sciences Rock and Ore collection. Large Eruptions of Rinjani Information about large Quaternary eruptions (VEI >= 4) is cataloged in the Large Magnitude Explosive Volcanic Eruptions (LaMEVE) database of the Volcano Global Risk Identification and Analysis Project (VOGRIPA).